Klyuchevskoy (Kamchatka): VAAC Anchorage sent out a message shortly before midnight (UTC) that the "eruption has ended" based on the absence of ash emissions from satellite imagery and pilot observations. This followed a particularly strong explosive phase that apparently occurred last night, when seismic data suggested strong emissions and an ash plume rose to possibly 33,000 ft (10 km) altitude. Webcam images from last night showed strong glow from lava flows and summit activity, but today the volcano has been hidden in clouds and no direct views have been possible so far. It is certainly too early to be sure whether the eruption has significantly decreased, has indeed ended surprisingly suddenly, or is simply pausing and could resume any time, as the VAAC report also remarks. Reventador (Ecuador): IGPEN reports no significant change in the currently mild, intermittent explosive activity. During the latest 24 hour observation interval, 12 ash explosions were recorded and observed ash plumes rose to about 1 km above the crater. 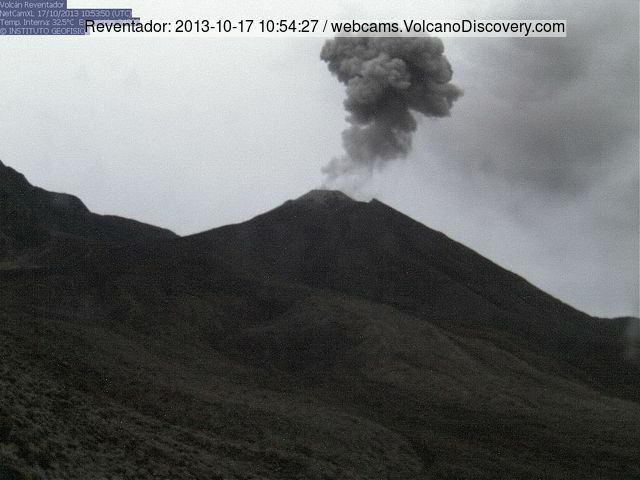 Tungurahua (Ecuador): Activity has been constant and slowly increasing. Strombolian explosions produce a column of gas and ash rising about 1 km, mostly driting west and north. Light ash fall has been reported from Penipe and Choglontus, and to the north, in Runtún. Near the volcano, constant rumbling is heard. Jebel Zubair (Red Sea): The submarine eruption continues to produce a steam plume visible on the latest satellite images. No evidence of ash is apparent, suggesting that the vent is still relatively deep. Barren Island (Indian Ocean): Eruptive activity continues. An ash plume was spotted on satellite imagery this morning rising to 12,000 ft (3.6 km) and drifting 15 nautical miles to the NW (VAAC Darwin).